DEB FRISCH FILES FALSE MOTION IN COURT, LIBELS DEFENDANT'S ATTORNEYS...ON SAME DAY! Eugene (Feb 16)--You just can't make this ish up. upped the ante by falsely denying her sending ANY vulgar, harassing, uncommunicative emails to the court AT ALL! in teh SAME WEEK that she's spewed vileness, libel, and sickness ALL OVER Facebook! Also stupidly, Teh Deb is turning her harassment toward teh judge magistrate overseeing Frisch's case. 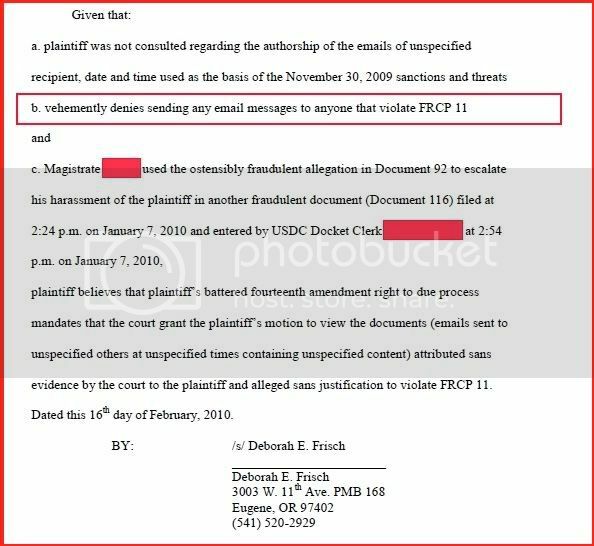 Frisch's harassment has, thus far, led teh judge to issue DumDeb a STFU order (on November 30th) and block DumDeb's email address from receiving Frisch's harassing emails (on January 7th). While she's wasting time on petty crap like this, the remaining defense lawyers are planning on having her involuntarily committed to the state mental hospital. Denying the reality of your actions, in this case, sending vile emails, is a major mistake on her part, particularly when her email host, pobox.com, keeps detailed and complete records on what email was sent from which IP, and her internet provider can track the IP back to her computer. The judge could quite easily have her computer taken for forensic analysis, as she's given him an opening by denying the emails and claiming he's abusing her "rights". All he'd need is a motion to do so from the defense team. Or maybe not even that, given her claims against him. A losing strategy, Deb. One you'll regret.